The underwater world is one of the most amazing wonders of our world. The ocean symbolizes life and and is respected in various cultures all over the world. In my home town of Roatan, Honduras, there is an idea that the ocean thrists for blood because of the lives it claims over the years. Certainly, it is a symbol of life and is teeming with life itself. It is estimated that two/thirds of ocean species remain undiscovered. I think that is an optimistic at best. We know very little of Ocean life. This brings to light the fact of the inmense diversity that call the ocean a home. Deep ocean creatures are ancient and have adapted to the survive in the blinding darkness of the waters for centuries. They are also some of the most amazing examples of life on this little blue rock. Here is a list of newly discovered sea creatures that will certainly raise an eyebrow. Beware of the ninja sharks! Sea dragons are are beautiful and mysterious creatures with an oversized name. Sea dragons are cousins of seahorses. Although known as the common seadragon, this species is Near Threatened. Greg Rouse and Nerida Wilson. 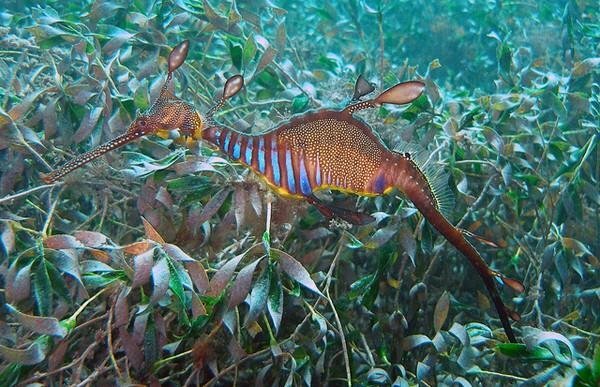 For 150 years, scientists have known of just two so-called seadragons: the leafy seadragon (Phycodurus eques) and the weedy seadragon (Phyllopteryx taeniolatus). 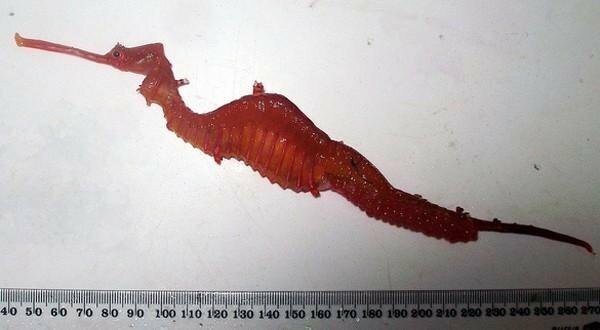 But a new paper in the Royal Society Open Science has announced the discovery of a third, dubbed the ruby seadragon (Phyllopteryx dewysea) for its incredible bright-red coloring. Found only off the southern Australian coastline, seadragons belong to the same family as the more familiar seahorses: the Syngnathidae. The male ruby seadragon (Phyllopteryx dewysea) that was collected in 2007. Photo by: Western Australian Museum. The fascinating thing about this capture is that this creature was actually discovered in shallow waters on the west coast of Australia. Again, as a reminder that we have so much more to discover in our vecinity. One more photo; an x ray comparison of the 3 known dragon species. 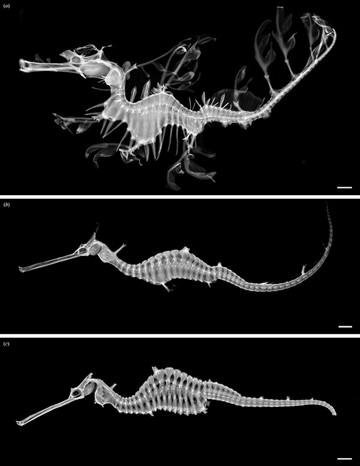 A comparison of the three species of seadragons (top: leafy seadragon; middle: common seadragon; and bottom: ruby seadragon) through X-ray radiographs. Photo by: Western Australian Museum. Now this ladies and gentlemen, is a fish that can fish. 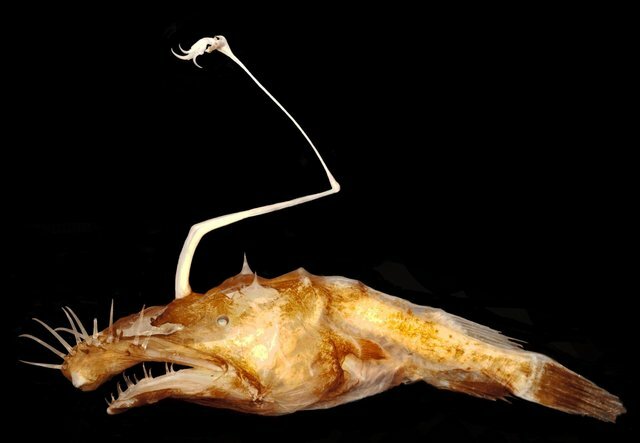 This new species of anglerfish, Lasiognathus dinema, was revealed in the Gulf of Mexico during a damage assessment of the 2010 Deepwater Horizon oil spills. With an unusual headpiece that looks, oddlly, like a fishing pole, this anglerfish is appropiately named. The pearly-hued cephalopod was spotted Feb. 27 in waters near the Hawaiian Islands, captured on video by a robotic vehicle deployed by the Okeanos Explorer, the National Oceanic and Atmospheric Administration (NOAA) ship that conducts ocean exploration around the world. What the mission scientists found on that dive was unexpected and striking. 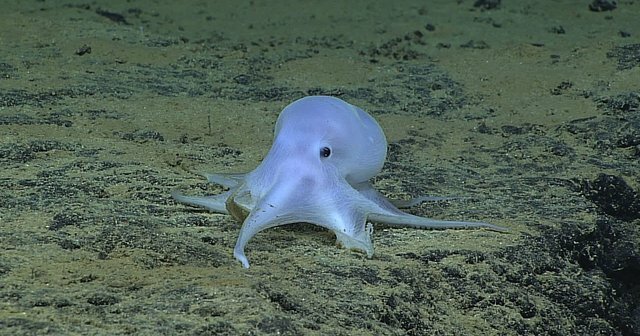 A peculiarly pale octopod — resembling an octopus but yet to be described — crouched on the ocean floor, apparently lacking the pigment cells, or chromatophores, usually associated with octopods. Its body also appeared to be less muscular than is usual for these animals, giving it an almost ethereal appearance that Michael Vecchione, a zoologist at the NOAA National Systematics Laboratory at the Smithsonian, and a curator of cephalopods at the National Museum of Natural History in Washington, D.C., described in a statement as "ghostlike." I personally like this little dude. Just look as his squishy mashmallow style. So beautiful and mesmerizing. For at last, I have saved the best. A new shark with a glowing head has been recently discovered! Glowing sharks are not new; there are around 40 known species of lanternsharks. 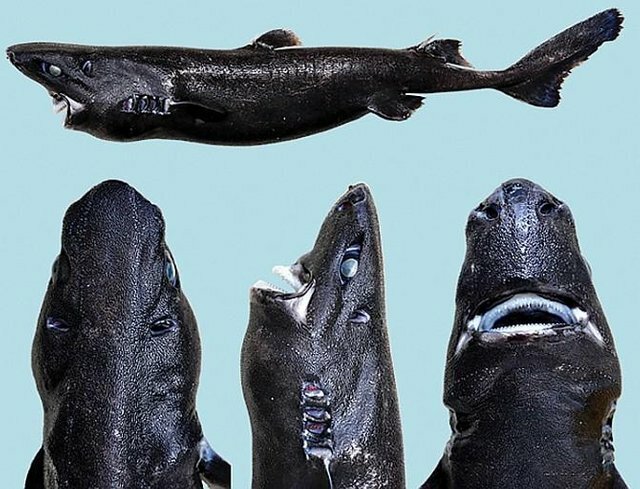 This is the latest shark discovered is very different than other lanternsharks because of its particular teeth structure. 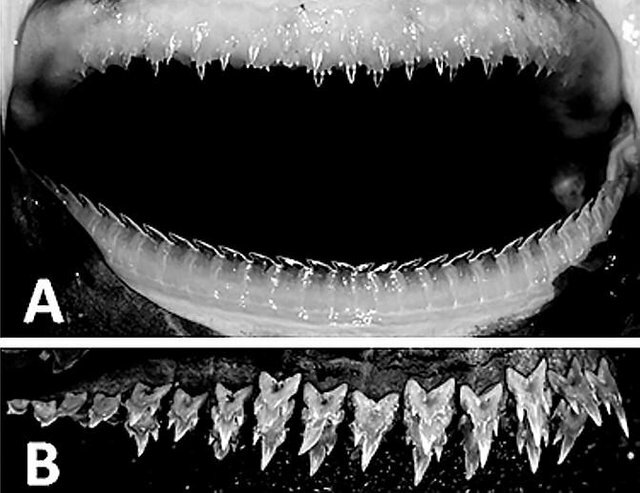 They were nicknamed ninja sharks for the sharp teeth and their dark slick appearence. In the picture below: researcher believe the top teeth are for grapsing food, while the bottom row is designed for slicing and cutting. These are very shark tooth and can certainly cause some damamge. Nearly 40 other species of lanternsharks, which are marine predators with the ability to glow, live in oceans around the world, including the Indian, Atlantic and Pacific oceans, said lead author Vicky Vasquez, a graduate student at the Pacific Shark Research Centre in California. However, this is the first time a lanternshark has been found off the Pacific coast of Central America, said Vasquez. Finding new species is very common when it comes to deep ocean exploration. The truth is that this is all unexplored territory. What comes to mind for me is the global die offs that we are simultaneously seeing in the oceans all over the world. As our ecosystems are being challenged we still know so little, it raises the question of what is the true extent of the damage to Marine life. The irony is that we have losing massive populations of life, while also discovering such new and diverse species everyday. This publications uses various external sources and images. We have quoted these to the best of our ability to provide correct citations. This blog is all about exploring the marvels of the ocean and critical thinking. Wow. I love the ocean creatures and ocean life. So beautiful and so interesting.